From the Cumberland Gap to the Atlantic Ocean, this is Virginia Water Radio for the week of October 13, 2014. Can you guess what kind of stocky-looking, feathered wetland-inhabitant makes that call? Have another listen for about 10 seconds while you consider this hint: you’d better listen at night if you want the crowning achievement of hearin’ this bird. 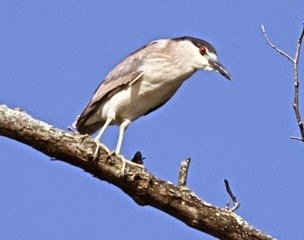 If you guessed a night heron, you’re right! That was the call of the Black-crowned Night Heron. 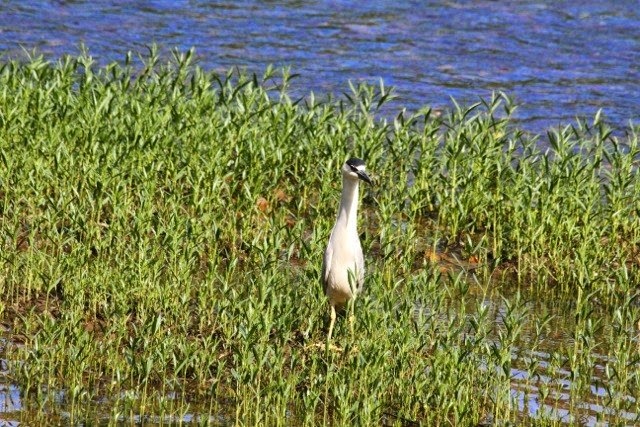 Named for black feathers on its head and back, this approximately two-foot-high bird is found throughout the year in Virginia’s coastal aquatic habitats; during summer breeding season, it’s also found in more inland areas of the Commonwealth. The Black-crowned Night Heron is considered the world’s most widespread species of heron, that group of birds with long legs, stout bills, and the habit of wading and fishing in shallow water. But this species—along with the Yellow-crowned Night Heron and a similar group, the bitterns—is known for being more secretive and nocturnal than other herons with which you might be more familiar, such as the Great Blue. The Black-crowned is also notable for its use as an indicator of environmental conditions, based on its wide distribution, aquatic feeding habits, and tendency to accumulate contaminants. In many a marsh or other wetland, as night falls, it’s a night heron that calls. Thanks to Lang Elliott for permission to use this week’s sounds, from the Stokes Field Guide to Bird Songs. Black-crowned Night Heron at the New River in Radford, Va., June 2014 (above) and in Pulaski County, Va., July 2014 (below). Photos from Robert Abraham, Christiansburg, Va., used with permission. The sounds of the Black-crowned Night Heron were taken from the Stokes Field Guide to Bird Songs-Eastern Region CD set, by Lang Elliott with Donald and Lillian Stokes (Time Warner Audio Books, copyright 1997), used with permission of Lang Elliott, whose work is available online at http://www.langelliott.com/ and the “Music of Nature” Web site, http://www.musicofnature.org/. Life in the Chesapeake Bay, by Alice Jane Lippson and Robert L. Lippson (Baltimore: Johns Hopkins University Press, 2006, pages 230-232. Other Virginia Water Radio episodes on birds are listed at our index, online at http://www.virginiawaterradio.org/p/index.html. Another heron species, the Green Heron, was the subject of Episode 127, 9-10-12. For selected news, events, and resources relevant to birds in Virginia, please see the Virginia Water Central News Grouper posts available online at http://vawatercentralnewsgrouper.wordpress.com/?s=birds. E-bird Web site at http://ebird.org/content/ebird/, maintained by the Cornell Lab and the Audubon Society: here you can find locations of species observations made by contributors, and you can sign up to contribute your own observations.